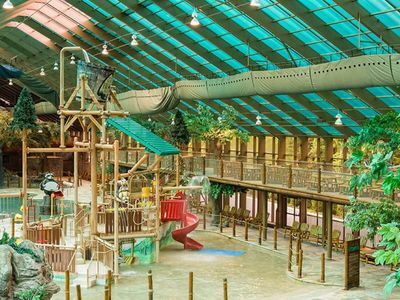 Family vacations are all about spending time together, and there’s no better place to spend that time than God’s Little Acre. 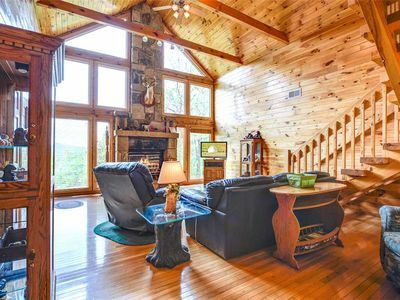 The 3-bedroom log home is a spacious, beautifully appointed getaway where the whole gang can hang out together without feeling as if they’re on top of one another; it also offers plenty of rooms where one can escape for some private time. 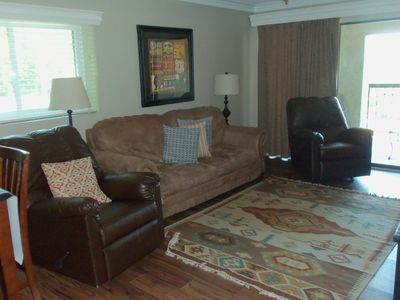 Just as important, it’s a short drive to just about all of the area’s attractions. 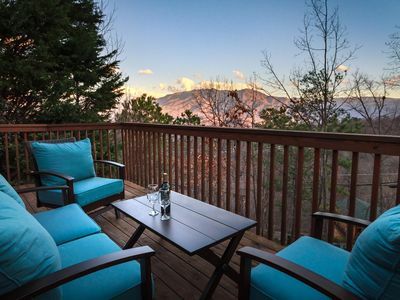 A custom-built home in Gatlinburg’s private Cobbly Nob neighborhood, God’s Little Acre exemplifies rustic refinement. 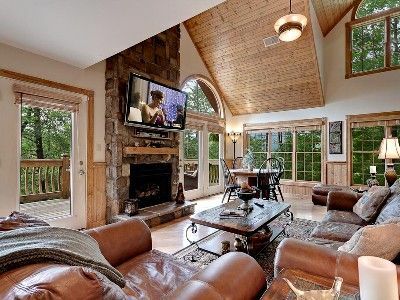 The double-height wall of windows lets you look out over the treetops toward the Great Smoky Mountains even as you relax in the living room. The sunlight pouring in shows off the lustrous wood-planked walls, floors, and cathedral ceiling to perfection. 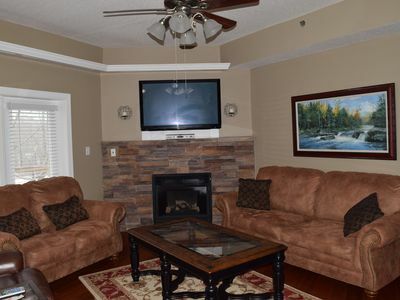 Whether you’re nestled on the leather sofa watching TV, curled up in the recliner with a good book, or playing charades in front of the stone-surround fireplace, you’ll feel right at home. The homey feeling extends to the dining area. There’s room for the whole family to gather at the log-style table, which seats 6 with ease. 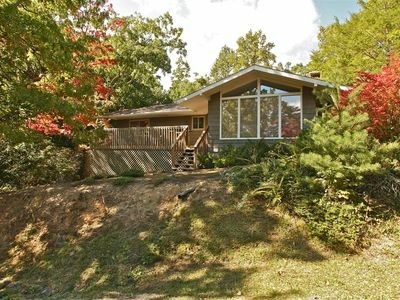 Or perhaps you’d rather take your meal outdoors to the large screened-in porch, which also has a table to accommodate 6. 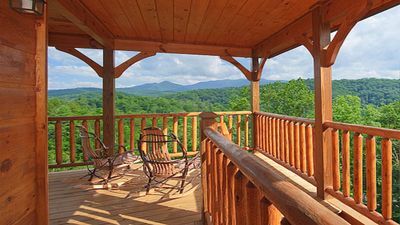 The porch is likely to be a popular spot for hanging out even when you’re not eating: The screens let in the mountain breeze while keeping uninvited buzzing guests out, and the ceiling fans ensure that the space feels cool even in the heat of summer. 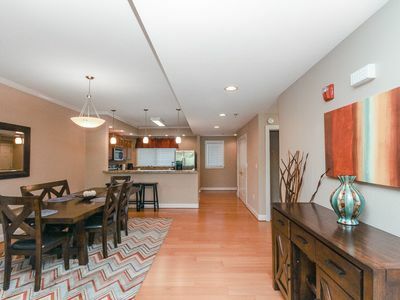 If you are eating in, rather than heading to one of the myriad nearby restaurants, you’ll find all the appliances, cookware, and tableware you’ll need in the fully equipped kitchen. What’s more, its open layout enables several people to cook at once: Mealtime prep can be a group activity. 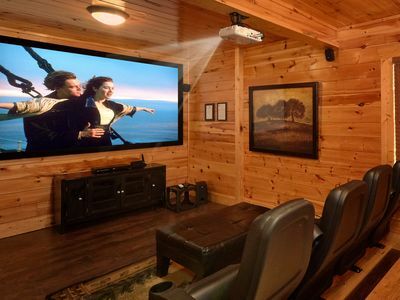 Yet another gathering spot is the loft’s den. The plush sofa and the roomy glider are ideal for watching a movie on the large flat-screen TV or surfing the web via the free WiFi. If you need to check in with the office during your stay, you can log in at the desk. 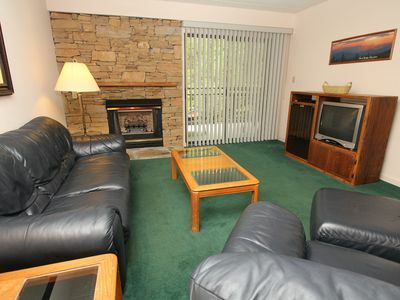 All 3 bedrooms are restful retreats, with wood-planked walls, log-style furnishings, and a TV. 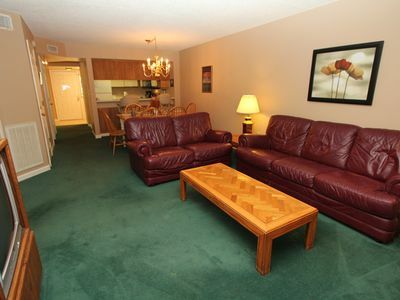 Two of the bedrooms are on the main floor; one includes a king-size bed, while the other has a queen. The master suite is up in the loft. 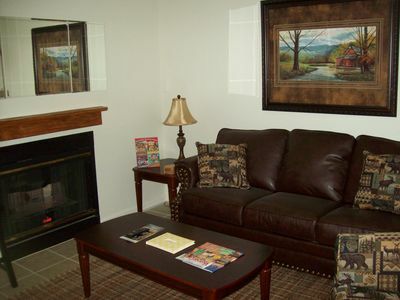 It too has a king-size bed, along with a comfortable reading chair and a private bathroom that boasts a jetted tub. After a day on the go, a long, lazy soak will feel so good! The 2nd bathroom, on the main floor, has a jetted tub as well. 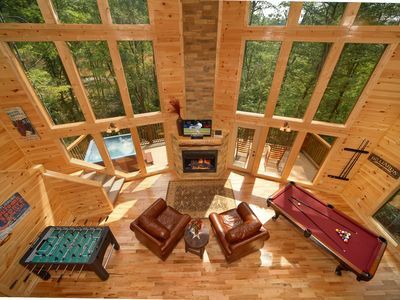 And the deck features a large hot tub. You can luxuriate among the steamy bubbles while watching the trees sway in the breeze during the day or while searching for constellations in the night sky. 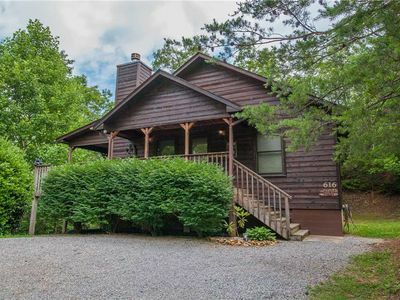 Because God’s Little Acre is located in Cobbly Nob—itself set within a 1,000-acre resort—when you stay in the summer you can swim in the neighborhood’s 2 outdoor pools. 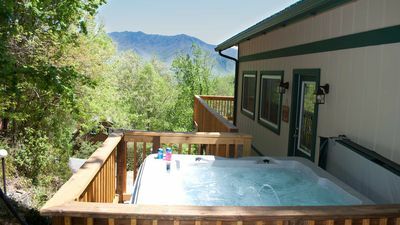 One of the pools is even within walking distance of the cabin. Any golfers in your group will be delighted to know that at the foot of Cobbly Nob is the Bent Creek Golf Course, designed by Masters and British Open champion Gary Player. 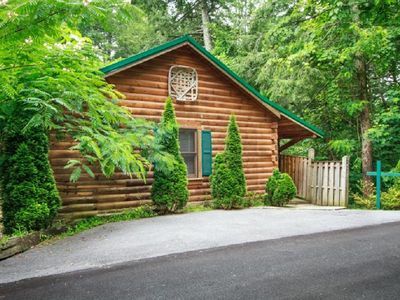 Just a bit farther afield is the Gatlinburg Arts & Crafts Loop, and in just about 15 minutes you can drive to the Great Smoky Mountains National Park, a true must-visit. 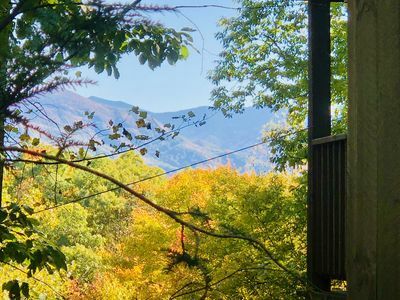 What’s more, God’s Little Acre is less than a half-hour from downtown Gatlinburg, home to restaurants, shops, the Guinness World Records Adventure, an aquarium, thrill rides, and a tram that will carry you over the town to Ober Gatlinburg Amusement Park and Ski Area. However you spend your days, you’ll love coming back to God’s Little Acre to enjoy good times with your family. So book your stay today, and get ready to make fun-filled memories you’ll long cherish. 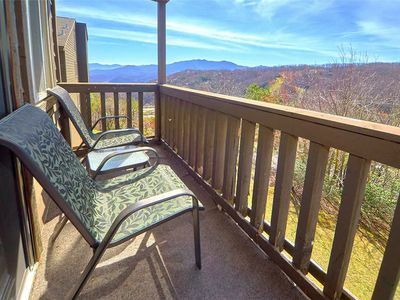 Great Cabin, Great Rates, Great Location, Great Views of the Great Smoky Mtns. 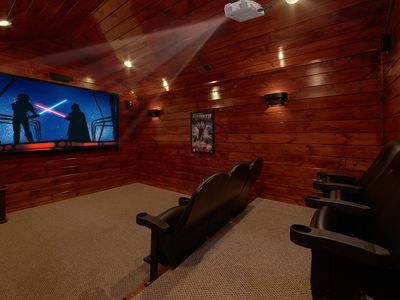 Private theater room with surround sound! 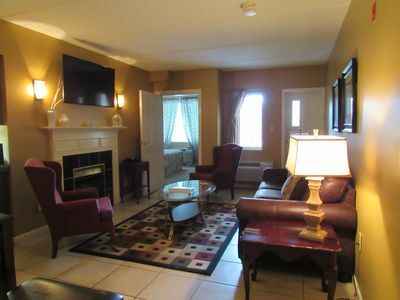 EZ Escape ~ Newly renovated with you in mind! ~ Perfect for a Honeymoon!